One shutout can make a pitcher feel good. Two can make him feel that much better. That was the case for Chris Hammond, pitcher on the 1994 Marlins. The hurler on a team one year removed from expansion shut out the Phillies that May, then came back and pitched eight shutout innings against the Pirates. "This is the best I've ever felt," Hammond told The South Florida Sun-Sentinel. "I've got five pitches I can throw for strikes. Going up there (on the mound) has started to become a lot of fun." Hammond was having fun in his fifth major league season. And he would continue to have fun in the majors through 14 big league seasons. Hammond's career began in 1986, taken by the Reds in the sixth round of the January draft out of the University of Alabama at Birmingham. 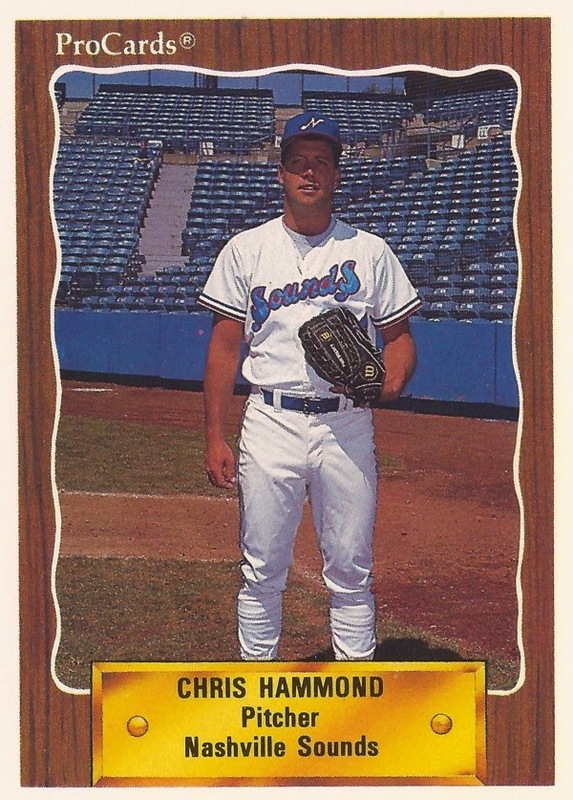 Hammond played that first year between the rookie Gulf Coast League and single-A Tampa. He made AA Chattanooga in 1988 and AAA Nashville in 1989. He debuted with Cincinnati in July 1990, going 0 for 2 in three starts. He also gave up eight earned runs in 11.1 innings. He returned in 1991 for another 18 starts, going 7-7, with a 4.06 ERA. Hammond started 1991 with a three-game personal winning streak. He then lost five straight. He broke that streak with a game where he walked five, but still got the win, The Associated Press wrote. "It would bother anybody," Hammond told The AP of the losing streak. "But then again, there were some games during that streak when I didn't walk many hitters and I didn't win, so I guess things even out eventually." Hammond stayed with the Reds through 1992. He was traded to the expansion Marlins in March 1993, in time for the expansion team to start its first season. With the Marlins, Hammond went 11-12 his first year, and 4-4 in 1994. In May 1995, Hammond helped himself at the plate, the pitcher hitting a grand slam. Though he couldn't help himself on the mound, going only four innings, The Sun-Sentinel wrote. In late July 1995, though, Hammond went seven shutout innings for the win. On the year, Hammond went 9-6, with a 3.80 ERA. He stayed with the Marlins through 1996, then returned in 1998, after spending a season with the Red Sox. He then retired, but came out of retirement for 2001. He pitched through 2006, also getting a chance to pitch in the 2003 World Series with the Yankees, against his old team, the Marlins. That second year out of retirement, Hammond played for the Braves, getting into 76 innings and posting a sub-1 ERA of 0.95. He was the third pitcher since 1900 to do that, The Sun-Sentinel wrote. His final year came in 2006, with Hammond returning to the Reds. He got into 29 games, with an ERA of 6.91. Hammond went into that final year knowing he'd have a bullpen role, but was fine with whatever role they'd give him. "Just pitch when the phone rings and your name is called," Hammond told MLB.com. "I'll be prepared to pitch, hopefully from the sixth inning on."